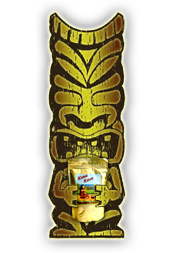 Kona Kava Farm Tin This reusable silk screened tin will hold up to 2 pounds of Kava root (or any other Kava product you want to keep in it). This durable food grade tin will provide years of use and abuse. It originally came free with the Kava Sampler Pack, but there was so much demand for these, we decided to offer them separately at a reduced price. Muslin Herbal Infuser (8"x10") These reusable muslin bags are perfect for making all kinds of herbal infusions (teas) and extracting essential oils. These bags have drawstrings at the top and are the perfect size for dropping into a cup or teapot. These bags have drawstrings at the top and are the perfect size for dropping into a cup or teapot. This is about the smallest size muslin bag that's still usable to both massage and strain your kava. Muslin Herbal Infuser (4"x6") These reusable muslin bags are perfect for making all kinds of herbal infusions (teas) and extracting essential oils. These bags have drawstrings at the top and are the perfect size for dropping into a cup or teapot. Soy Lecithin (2 oz) OUT OF STOCK - DO NOT ORDER! is the perfect companion to all of your kava extractions, and is not only good for you as well, it's completely vegan. It's the perfect ingredient to extract the active components of kava kava, making for a more potent drink than you would have had otherwise. It also adds no flavor of it's own. Works with instant drinks as well as our powdered root. 1 teaspoon per drink is all that's needed. Kava Coco Cup - One Cup These authentic cups made from real coconuts are imported directly, not from Hawaii, but the Philipines. Kava is traditionally consumed out of coconut shells just like these, which are as authentic as they come. Since Mother Nature creates these, no two are alike and perfectly matched sets are not possible.